For supporters and detractors alike, few services exemplify the modern “on-demand” economy more than ride-hailing apps. Unlike traditional taxi cabs that require customers to hail a car on the street or call into a central dispatch, these apps allow users to request a ride using their smartphone, track the progress of their driver in real-time, and offer an integrated payment and ratings system. The drivers for these services are frequently part-time or “gig” workers who use their own vehicle and combine their ride-hailing work with other sources of income. For instance, a 2015 survey of Uber drivers found that around six-in-ten drivers work another job in addition to driving for Uber. Indeed, the phrase “Uber for [X]” (along with Lyft, its main competitor, Uber is the largest and most well-known of these services) has become technology industry shorthand for a range of services that let users connect in real time with people who are willing to be hired to do various tasks – such as doing laundry, buying and delivering groceries or cooking dinner. The following chapter of this report examines the broader contours of the on-demand economy through the prism of these ride-hailing apps. For most users, ride-hailing is a relatively sporadic activity: 26% of ride-hailing users indicate that they utilize these services on a monthly basis, and an additional 56% use them less often than that. However, close to one-in-five users utilize ride-hailing much more frequently: 3% indicate that they use these services on a daily or near-daily basis, while 14% indicate that they use them weekly. 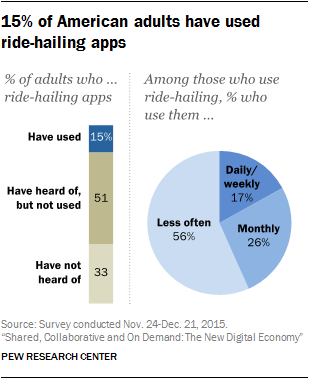 Put differently, 3% of all American adults use ride-hailing services on a regular (i.e. daily or weekly) basis, while 12% use these services once a month or less often. As is the case with many new technologies, ride-hailing usage varies significantly by age. Roughly one-quarter of 18- to 29-year-olds (28%) and one-in-five 30- to 49-year-olds (19%) have used ride-hailing, but just 4% of Americans 65 and older have done so. Indeed, the median age of adult ride-hailing users in the United States is just 33. In addition to having high rates of usage in general, young adults also are especially likely to use these services frequently. Some 7% of all 18- to 29-year-olds (and 10% of 18- to 29-year-olds living in urban areas) use ride-hailing on a daily or weekly basis. Just 3% of 30- to 49-year-olds, and fewer than 1% of Americans age 50 and older, use ride-hailing with this degree of frequency. 29% of college graduates have used ride-hailing services and just 13% are unfamiliar with the term. Among those who have not attended college, just 6% have used these services and half (51%) have never heard of them before. There are no substantial differences in ride-hailing usage across gender or racial lines: Men and women are equally likely to use these services, as are whites, blacks and Latinos. Ride-hailing apps primarily offer their services in and around urban areas – and accordingly, both usage and awareness of these services among rural residents is extremely low. One-in-five urban Americans (21%) have used ride-hailing services, as have 15% of those living in suburban areas. 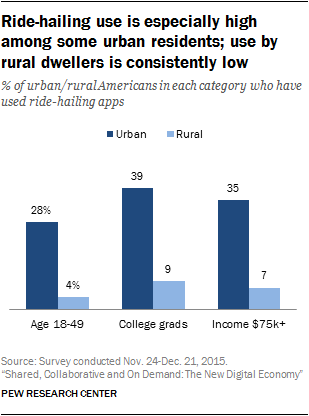 By contrast, just 3% of rural residents have used these services and more than half (54%) have never heard of ride-hailing apps. And as is the case among the population as a whole, certain demographic subgroups living in urban areas – such as young adults, or college graduates – use ride-hailing at especially high rates. For instance, fully 39% of urban college graduates have used ride-hailing services at one point or another, as have 35% of urbanites earning more than $75,000 per year and 34% of 18- to 29-year-old urban dwellers. Conversely, usage by rural residents is consistently low – even among groups with high levels of usage at the general population level. For instance, just 9% of rural college graduates have used a ride-hailing service (versus 39% of their urban counterparts), as have 4% of rural residents under the age of 50 (compared with 28% of urbanites younger than 50). Among the 51% of Americans who are familiar with ride-hailing apps but have not used them personally, roughly half (52%) indicate that these services are available where they live. Another 19% say these services are not available where they live, while the remaining 28% are not sure if those services are offered where they live or not. Put somewhat differently, 27% of all American adults are both familiar with ride-hailing services and are aware that they live in an area where those services are offered, but have not yet tried ride-hailing themselves. However, 6% of these nonusers have ridden with someone else using a ride-hailing service, even if they personally did not request the ride. Not surprisingly, the vast majority of ride-hailing users say these services are available where they live – but a minority of users appear to use these services only when they are away from home. Some 8% of those who have used ride-hailing say these services are not available where they currently live. In fact, 6% of Americans who use ride-hailing regularly (on a daily or weekly basis) indicate that these services are not available in the location where they reside. As a relatively new phenomenon, the extent to which ride-hailing services replace or supplement other types of personal transportation has been the subject of some debate. Uber founder Travis Kalanick has said in interviews that one of the company’s long-term goals is to “get to where it’s cheaper to take Uber than to own a car,” but a New York Times analysis of Uber and taxi rider data in New York City found that use of taxis as well as ride-hailing is highest in neighborhoods with a robust public transportation infrastructure. These Pew Research Center data indicate that frequent ride-hailing use is indeed correlated with lower-than-average rates of personal vehicle use and ownership. But these regular ride-hailing users also use a wide range of personal transportation options that go well beyond ride-hailing alone – from taking public transit, to walking or biking, to using traditional taxi services. To be sure, a majority of ride-hailing users – even those who use these services frequently – are vehicle owners and drive a car regularly. Roughly two-thirds (64%) of regular ride-hailing users3 say they own a personal vehicle of some kind, and 63% say they drive a car on a daily or weekly basis. However, each of these figures is substantially lower than among non-ride-hailing users, or among those who use ride-hailing services on a relatively infrequent basis: 78% of both nonusers and infrequent users own a personal vehicle, and more than eight-in-ten drive a car on a regular basis. Yet even as these frequent ride-hailing users are less likely than other Americans to own or drive a car, they are significantly more likely to use a wide range of other personal transportation options in addition to ride-hailing. 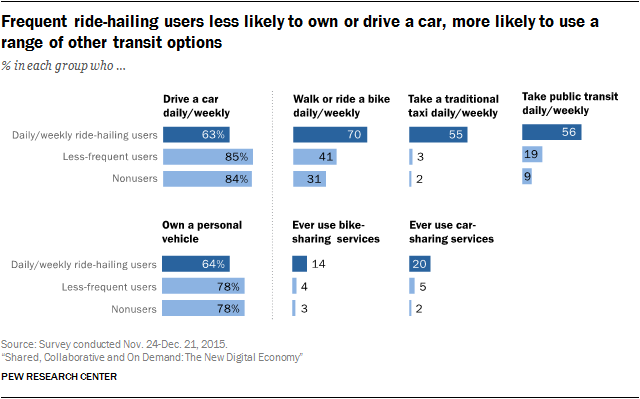 Among daily or weekly ride-hailing users, 70% report that they regularly walk or ride a bike somewhere; 56% regularly take public transportation; 55% regularly use traditional taxi services; 20% ever use personal car-sharing services such as Car2Go or ZipCar; and 14% ever use bike-sharing services. In each instance, frequent ride-hailing users are significantly more likely than other Americans to engage in these behaviors. At the same time that ride-hailing services have upended the market for traditional taxi services, they also have posed new challenges to long-standing legal and regulatory structures in cities across the country, as well as abroad. Indeed, a Wikipedia page is dedicated to tracking the current legal status of Uber service in various cities around the globe. The specific regulatory issues at play differ from city to city – but on a broad level this debate often boils down to whether these new entrants to the for-hire vehicle market should be subject to the same rules and regulations as legacy taxi services that operate under a quasi-government monopoly in exchange for relatively strict rules regarding issues such as insurance requirements, handicap access or fares and rates. The survey asked two separate questions relating to ride-hailing and regulation. First, it asked respondents how much (if anything) they have heard about the debate over how best to regulate ride-hailing services. Second, those who have been following this debate were asked whether ride-hailing services should be required to follow the same general rules and regulations as existing taxi operators, or if they should be free to operate outside of this existing framework. The share of Americans who have at least some familiarity with the debate over ride-hailing regulation tend to favor a hands-off approach to regulating these services – if only by a slim margin. Some 42% of these Americans feel that these services should not be required to follow the same rules and regulations as existing taxi companies, while 35% think that they should have to follow these rules (the remaining 23% are not sure how they feel about this issue). But if the public as a whole is not following these debates especially intently, ride-hailing users themselves are paying much closer attention to this issue. Fully 85% of ride-hailing users have at least some familiarity with the regulatory debates surrounding these services, with 39% indicating that they have heard “a lot” about them. Frequent users (those who use ride-hailing on a daily or weekly basis) are paying especially close attention: An overwhelming 97% of these regular users indicate that they have heard at least something about the controversy over ride-hailing regulation, with 58% indicating that they have heard a great deal about it. In addition to following this debate more closely than the average American, ride-hailing users also feel more strongly that ride-hailing services should not be subject to the same rules and regulations as existing taxi companies. Among ride-hailing users who have heard of this debate, 57% believe that these services should not be required to follow the regulations that are in place for incumbent providers – compared with 27% who believe that existing rules and regulations should in fact apply to these new market entrants (another 16% of these users are not sure how they feel). This general anti-regulatory attitude is particularly notable given the overall political leanings of ride-hailing users as a group: As a whole, ride-hailing users are twice as likely to identify as Democrats as Republicans (65% identify with or lean toward the Democratic Party, while 33% identify as or lean Republican). In addition, ride-hailing users are also roughly twice as likely to identify as liberal as to identify as conservative. And not only is this group relatively liberal in their overall political attitudes, but ride-hailing users who identify with or lean toward the Democratic Party believe (by a 54% to 30% margin) that these services should not have to follow the same regulations as incumbent providers. Similarly, ride-hailing users who identify as political liberals tend to believe (by a 48% to 30% margin) that a flexible approach to regulating these services is most appropriate. To be sure, Republican and/or conservative ride-hailing users tend to have a more anti-regulatory attitude than Democratic and/or liberal users, but the clear preference for a light regulatory approach among partisans in all camps is striking. In addition to whether or not ride-hailing apps should be regulated in the same way as legacy taxi services, a second major policy debate surrounding these services (as well as many others in the so-called “gig economy”) is over whether ride-hailing drivers are employees of those services or independent contractors who work for themselves. Ride-hailing services have long maintained that they do not have an employer/employee relationship with the drivers who use their products – rather, they are a technology platform or marketplace that allows independent drivers to connect with customers in need of their services. Indeed, these services often argue that this independent-contractor relationship is precisely what allows these services to remain commercially viable, since the firms can provide greater flexibility and independence to workers while offering their services at a low cost to end users. By contrast, many drivers and worker advocacy groups argue that these services engage in a variety of behaviors that make them employers in all but name. A recent class-action lawsuit brought by Uber drivers, for instance, argued that these drivers “… are required to follow a litany of detailed requirements imposed on them by Uber and they are graded, and are subject to termination, based on their failure to adhere to these requirements (such as rules regarding their conduct with customers, the cleanliness of their vehicles, their timeliness in picking up customers and taking them to their destination, what they are allowed to say to customers, etc. ).” The suit, which was settled after this survey was conducted, contended that drivers should therefore be afforded the various rights and protections that accrue to employees under law. When asked about their view of the relationship between ride-hailing services and the drivers who operate under those services, users tend to side with the notion that these services are software platforms rather than transportation companies, and that their drivers are independent contractors rather than employees. But these views are far from universal – and users also expect ride-hailing companies to play a hands-on role in some traditional employer behaviors, such as making sure that drivers are trained appropriately and generally vouching for the overall customer experience. When presented with two alternative descriptions of ride-hailing services, 58% of users indicate that they see them as software companies that simply connect drivers with people who are looking for a ride. Meanwhile, 30% side with the notion that they are transportation companies that have a great deal of control over their drivers and the overall customer experience. Frequent ride-hailing users (those who use these services weekly or more often) feel especially strongly about this subject, siding with the view that these services are software companies by a 70% to 26% margin. Similarly, when asked to choose between two alternative descriptions of the drivers who work with these services, fully 66% of users describe them as independent contractors who simply use these services to connect to potential customers. This is nearly three times the share of users (23%) who view ride-hailing drivers as employees who work directly for the app or service that customers use to book a ride. Interestingly – and in contrast with their views on the preceding question – frequent users are actually a bit more likely than other users to view ride-hailing drivers as employees, rather than independent contractors: 35% of these frequent users describe these drivers as employees, while 59% describe them as independent contractors. 68% of ride-hailing users believe that both drivers and the services themselves should be responsible for making sure that drivers are properly trained. One-quarter (23%) believe this is the sole responsibility of the services, while 8% think it is the responsibility of each individual driver. 62% of users believe that both drivers and services should be responsible for making sure that the vehicles customers request are clean and safe. Some 12% think this is the responsibility of the services alone, while 24% think it is up to individual drivers to ensure this. As is true of many aspects of ride-hailing, frequent users of these services feel differently about these issues than occasional users – although their views do not consistently place greater responsibility on drivers or on ride-hailing services themselves. On the one hand, these frequent users assign greater responsibility to ride-hailing services when it comes to initial driver training: 33% of frequent users and 21% of occasional users believe that this is the sole responsibility of the services. On the other hand, frequent users assign more responsibility to drivers when it comes to day-to-day vehicle safety and maintenance: 36% of frequent users and 22% of occasional users believe that this is the sole responsibility of individual drivers. And while there are relatively few demographic differences on this issue, male ride-hailing users tend to assign greater responsibility for both driver training and general vehicle maintenance to drivers (as opposed to the app or service) compared with female users. Some 12% of male ride-hailing users feel that drivers should be solely responsible for their own training (just 4% of female users agree), while 29% of male users feel that drivers should be solely responsible for ensuring vehicle safety and cleanliness (compared with 19% of female users). Like many new technologies, the popular discussion about ride-hailing apps has been marked by strong views on both sides. Ardent supporters of ride-hailing promote these services as a potential solution to a wide range of ills – from helping people who might have trouble hailing taxi cabs due to their race or appearance, to providing independence for older adults who aren’t able to drive on their own. Detractors, on the other hand, view these services as a luxury good for people with plenty of existing transportation options, or worry about the potential privacy implications of the vast store of user data they collect. 86% of ride-hailing users indicate that these services save their users time and stress, with just 3% indicating that this statement does not describe ride-hailing well. Nonusers are also inclined to see these services in a positive light on this front (by a 44% to 5% margin) although 49% are not sure if this is a good description of ride-hailing or not. 80% of ride-hailing users believe that these services provide good jobs for people who want flexible working hours, with just 6% indicating that this statement does not describe these services well. Nonusers are also positively disposed toward ride-hailing services on this front, with 58% saying this statement describes ride-hailing services well. Ride-hailing users (and to a somewhat lesser extent, nonusers) also tend to view ride-hailing services as a good option for older adults who have a hard time getting around on their own. Some 73% of ride-hailing users indicate that this statement describes these services well, as do 51% of nonusers. Interestingly, 10% of ride-hailing users ages 18-29 believe this statement does not describe ride-hailing services well, compared with just 3% of users ages 50 and older. Lastly, ride-hailing users tend to broadly support the notion that these services use drivers they feel safe riding with. Seven-in-ten ride-hailing users (70%) say this statement describes these services well, while only 5% of users feel that this is not the case (the remaining 24% are not sure how they feel on this subject). Nonusers are more than twice as likely to agree (24%) as disagree (9%) with this statement, though 66% are not sure how they feel. News reports about the safety of ride-hailing often place a particular emphasis on the safety of female passengers – and this survey does find some modest evidence that female passengers are a bit more concerned about the driver-safety issue than men. Some 7% of female ride-hailing users believe this statement does not describe these services well, double the 3% of men who feel the same way. At the same time, a substantial 68% majority of female ride-hailing users feel that this statement does in fact describe ride-hailing services well. In addition, driver safety concerns do not appear to be a particular barrier to entry for women who currently do not use these services. Some 23% of female nonusers (and 24% of men) feel that this statement describes ride-hailing services well, while 8% of female nonusers (and 10% of men) believe it does not describe them well. Users’ attitudes on the subject of driver safety are also correlated with how often they themselves use ride-hailing services: Frequent users (those who use these services on a daily or weekly basis) are simultaneously more positive and more negative on the subject of driver safety compared with infrequent users. Fully 82% of these frequent users feel that ride-hailing services use drivers they feel safe riding with (compared with 69% of infrequent users). At the same time, 13% of frequent users feel that this statement does not describe these services well (compared with just 3% of infrequent users). Put differently, frequent users are simply more likely to have some sort of opinion (whether a positive or negative one) on whether or not they feel safe with ride-hailing drivers: Just 4% of frequent users are not sure if this statement describes ride-hailing services well, while 28% of less-frequent users don’t have a strong opinion one way or the other. Along with these attributes on which there is especially strong agreement among users, the survey asked about several other attributes on which ride-hailing users largely agree – if not always as consistently as on those listed above. 68% of ride-hailing users agree that ride-hailing services are less expensive than taking a taxi, although 12% do not think this statement describes these services well and an additional 20% are not sure if ride-hailing is cheaper than a traditional taxi service or not. Roughly two-thirds of nonusers (64%) are unsure how these two services stack up in terms of price, although 29% think that ride-hailing offers a cost savings over more traditional options. 60% of users think that ride-hailing services are more reliable than taking a taxi or public transportation – although 14% indicate that this statement does not describe these services well. Frequent riders feel especially strongly that these services are more reliable than other options: Fully 77% of frequent ride-hailing users feel this statement describes ride-hailing services well, compared with 57% of those who use ride-hailing less frequently. Interestingly, users’ views on this issue are quite consistent regardless of whether they themselves use taxi or public transit services: Some 60% of ride-hailing users who also use public transit services feel that this statement describes ride-hailing well, as do 63% of ride-hailing users who also use traditional taxi services at least on occasion. 50% of users feel that ride-hailing services serve neighborhoods that taxis won’t visit, with 9% indicating that this statement does not describe these services well and 41% indicating that they are not sure. 43% of ride-hailing users agree that these services are mostly used by people who already have plenty of ways to get around, although 21% feel that this is not the case and 36% are not sure what to think. Finally, there are two attributes that ride-hailing users generally think do not apply to these services. As noted above, most users feel that these services are an excellent option for older adults – but they are much less comfortable with their use by unaccompanied minors. Only around one-third (34%) of ride-hailing users feel that these services are a good way for parents to make sure their children get around safely when they can’t drive them, with 26% indicating that this statement does not describe these services well (40% are not sure). Nonusers are even more apprehensive on this issue: just 17% think these services are a good option for children, while 28% think they are not. Interestingly, there are no differences between parents and non-parents on this question: 30% of ride-hailing users who are parents feel that this attribute describes ride-hailing services well, similar to the 35% of non-parents who agree. But frequent users are more likely than occasional users to feel that these services are a good option for parents with small children: 47% of these frequent users believe this statement describes ride-hailing well, compared with 31% of occasional users. Privacy concerns around the retention of users’ personal data is the second issue that largely fails to register with ride-hailing users. In contrast to traditional taxi services (which can be used relatively anonymously) ride-hailing services collect a substantial amount of personal information about their users: from payment information to detailed trip and location histories. Yet by a five-to-one margin, ride-hailing users reject the notion that these services collect too much personal information about their customers. Just 11% of ride-hailing users feel that this statement describes these services well, while 50% disagree (the remaining 39% of users are unsure if this describes ride-hailing services well or not). Nonusers generally do not have strong feelings on this issue one way or another: fully 77% are not sure if ride-hailing services collect too much personal information about their users or not. Most users indicate that their experiences with ride-hailing services have been universally positive. Fully 83% of ride-hailing users have never had a bad experience while using these services, while 16% report that they have had a negative experience at some point or another. Daily or weekly users of these services are more likely than less-frequent users to have had a negative ride-hailing experience: 53% of frequent users say they have had a negative ride-hailing experience at some point or another, although a roughly equal share (47%) report that they have never had any sort of bad experience using ride-hailing. Younger users (who as noted earlier tend to use these services on a relatively frequent basis) also tend to encounter bad experiences at higher-than-average rates: 20% of users ages 18-29 have had this happen to them, compared with 9% of users ages 50 and older. And men and women encounter bad experiences with ride-hailing with similar frequency: 14% of male users have had some sort of bad experience with ride-hailing in the past, similar to the 18% of female users who have done so. Just as ride-hailing users are much more likely to have good experiences than bad experiences using these services, nonusers are much more likely to have heard positive things about ride-hailing than they are to have heard negative things. Among nonusers who are aware of ride-hailing, 55% have heard of others having good experiences with these services – double the 28% who have heard of others having bad experiences with ride-hailing. And as was the case with users’ own experiences, male and female nonusers encounter similar opinions of ride-hailing in their interactions with others. Among male nonusers, 54% have heard of other people having good experiences with ride-hailing and 29% have heard of other people having bad experiences. Among female nonusers these figures are nearly identical: 56% of women have heard of others having good experiences, and 26% have heard of others having negative experiences.